Wouldn’t you just love to get up to a fresh new home every morning? A clean kitchen welcoming you to start your day… no dishes or clutter on the counter too. The bathroom, so well organised and everything just where you want it. Such that… you could actually reach for things with your eyes closed. No worry about the mismatch socks too. Bags and shoes waiting by the door… everything set and ready for work and school… Is it possible to wake up to this? What if you had a little help with it? A little team… may be little Elves at night who did the job? Yes. That would be possible, if only… elves really did come to clean houses every night. We were always asked to clean up after ourselves. Honestly, we never really did clean up. Like all households, my mother did nag us and dad did with-hold our allowances and there were complaints and arguments all the time. Then one day, a new set of rules were made. Every night before going to bed, everyone in the family would do one chore. Since we were all different ages, we were alloted the chore according to our age. We had the freedom to do whatever we liked through the day. We could keep our rooms a giant clutter hole or we could build those towers of mattresses to jump on but at the end of the day before going to bed, one person was responsible for clearing that up to make everyone’s bed. That person would not be very happy doing it all so, through the day, he or she would mind the others and make sure the clutter was in control. The person whose responsibility it was to clean up the dining table at night, didn’t like all the stuff collecting all through the day, so he or she would make sure that it was done at the right time or everybody did their share. The person whose responsibility it was to press the uniforms, didn’t like having to press them every day of the week so, he or she made sure the younger ones would hang up their uniforms and not throw them somewhere. You see, we started working as a team because having disagreements meant that we’d have to take our own dishes, make our own bed and press our own uniform along with a lot of different things. We started looking out for each other, helped each other out too and after a few days, it actually became fun and like a game. We would compete to see who finished fast or who had less work at the end of the day. It isn’t like my parents didn’t do anything. They did their own share too. The end result was that we all woke up to a cleaner more organized morning and slept in a clean house every night. Our parents were happier and they had more time to talk and play with us. We were happy because we felt like we were contributing to the family has a whole. Our family became stronger because we all worked together towards one goal: a clean, happy morning. Fast forward to my life with my kids. Ever since we had kids, I have always felt like I have the weight of the whole world on my shoulders. With babies… they are all so dependant on us. With a little toddler and a baby, life became a juggle. When we had three kids, the eldest one was always feeling neglected. I started to wonder how my mum did it all. And then… I remembered. I have started to implement these in my life for the past three years now. I had my fourth child last year and although my children are still very small and we do deter from this plan many times but when we do stick to this, our house remains clean and we do get up to a bright clean morning. I have talked about the ‘Don’t Fret Just Kiss Rule’ in my Life Skills post. Here are 10 things, that don’t require more than 10 minutes each, that you can do every night to make your mornings really stress free. These are things that you can involve your family in too. Make it a bedtime routine for everyone, actually. That is how we do it around here. 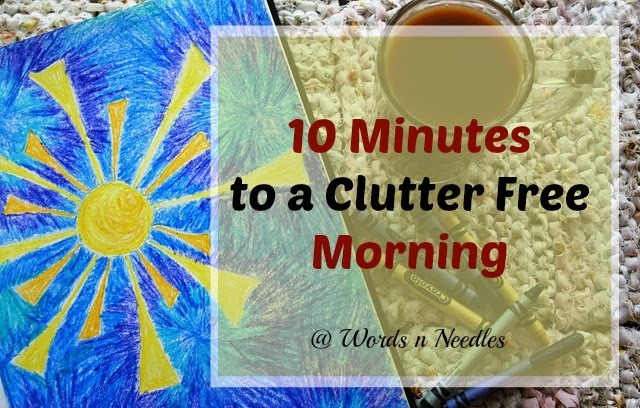 I hope you can use these to make your mornings easier and your home more organized. 2. Clear the tables off. NO newspapers, mail or clutter there. If you save newspapers or magazines, for whatever reasons, then keep them in their allotted place off the tables. Mail should never be left lying on the table. If it lies on the table, it will collect and it will be forgotten. Be smart, as soon as you get the mail in the morning, stand by your trash can while you sort it out. It is easier to collect less stuff and answer the mail right away. Also try to avoid getting home stuff that you don’t need. Pamphlets, shopping inserts, flyers… they are clutter. When you go to museums or travel, those maps, itinery plans and magazines… those are clutter. If you really need somethimg from it, tear that article and bring it with you, leaving the whole magazine behind. 3. File Paper Work. Every night before going to bed, we file our papers. We didn’t do this for years and it was a nightmare when we finally sat down to figure it out. There was just so much to do. We then, got into the habit that either my husband or I would sort it out every night. School papers, the bills, whatever has come in. Usually it is less than 5 papers for us now. Imagine what would happen if it was 5 papers collecting everyday for weeks or months lying there! 4. Empty your pockets and purses and get them sorted. We started doing this after I washed away a few important papers and found a lot of coins in the washer! Since we are filing paper work, emptying those pockets will make all those things like receipts and phone numbers and addresses (if you are the scribbling kind ) scrambling out. Keep a separate box or folder for receipts. I can’t tell you how much time we have wasted finding a receipt for exchanging an item. So, every night get the stuff out of your pockets, put the receipts away, cash and coins sorted and if you will be needing another purse the next day, move all of your stuff the night before so that you are ready the next morning. 5. Store technology, chargers, media, remotes, CDs/DVDs out of sight. It is best if we can all learn to put things away as soon as we have used them but so often, this doesn’t happen. Every night, before you switch off those lights, put the laptop in its place, store the chargers away, replace those DVDs in those racks and give your living room a once over to see that you won’t accidently be sitting on a remote! 7. Put back toys. This is another thing that I have added to my children’s bed time routine. Put the toys away before bedtime. That is how they start their bed time routine actually. This tells them that it is time for bed and time to stop playing. 8. Tidy up the homework and arrange the bags. We also get our son to pack his homework and bag before bed time. This prepares him for the next day. I assist him in picking out his dress for the next morning too. When you ready your bags and clothes, make sure you put out the shoes and socks too. 9. Put kitchen items away. I always find that the reason my kitchen gets cluttered is because of what gets on the counters. Those appliances, dishes or utensils, the ingredients or what escaped from the measuring cup… you know? When I started putting things back in their place every night and just wiping the surface with a wipe, it really helped keep things tidier. The dishes? I know…! The best solution and that I swear by now (even though sometimes I fail..), is to put them away as and when you finish using them. As soon as you are done in the kitchen, load that dish washer. As soon as you come in again and you see it needs emptying, put the things away. In the beginning it seems like you have to do it in spite of yourself but trust me, in less than a week it becomes a habit. Stick up a brightly coloured note if you need a reminder but really, it helps! 10. Clean all bathroom surfaces. The last thing that everyone does before bedtime is, use their bathrooms. 🙂 So, when you are done using it, (usually, it is always the mum who is the last person to go to bed!) throw those dirty towels into the laundry and put those items away. Give everything a spray of water or wipe it clean with a paper towel or disinfectant wipe and you are done! Tell me what you do to make your mornings easier. I would love to hear from you. Do join us on our Facebook Page and if you are interested, join our mailing list above. 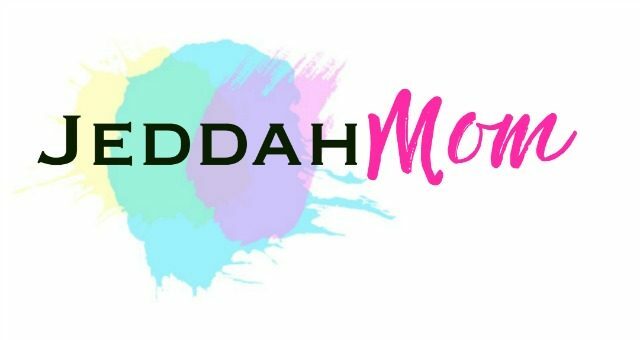 Disclaimer: JeddahMom and its content are for informational purposes only and should never be used as a substitute for advice from a qualified professional. Welcome to Confident Deliberate Motherhood! Do you want to create a loving, happy, organized home environment where everyone (including the mom!) can thrive? Here on Jeddah Mom, we Play, Pray and Parent with passion! Come on and join us. Read more about Jeddah Mom here. Copyright © 2017 All Rights Reserved | Jeddah Mom | All text, images, design, titles, recipes, and other matter appearing on Jeddah Mom are copyrighted. No part may be transferred, modified or copied - digitally or otherwise - in any manner without written permission from Aysh Siddiqua.